I have been a woman obssesed lately. I admit it. with all the hardship it takes to admit an addiction, I admit, im addicted to cuteness. I always featured cute items on my collection, but never did I feature so many. The thing is I always liked kittys, as you may know I already have 2 cats at home, sasha and lilly which are amazingly sweet and always seem to inspire me. Last year lilly "helped" me sew ( she sat next to me and played with the sewing thread I was using) and while she ran around the house for the 1000 time with the overlock threads in her mouth ( she has a special relationship with my overlock machine, she hates it and trys to de thread it as much as she can) I thought to myself I have to, but have to add ears on the hoodie I was making. It was an engeneering process of how to acieve this, because there are a few important issues on hand. How do you make them stand up? which size should they be? if they are to big it looks unproportional and a bit iddiotic and if they are to small they are not really noticable. and what should I make them out of? and how can I add to it, to give it the perfect finishing touch? Luckily I remembered some doll making tips from the time my sis and I made teddy bears when we were in Australia ( we were big on arts and crafts back then), I decided to make the ears out of felt, the best material for these to my opinion, and to stuff them, like making stuffed doll. As for the special ingrediant, I went for small patches on the front, my first patch was a kitty paw. My test hoodie came out adorable, and was a pretty succesfull piece. Well this year I started getting pre orders for my kitty hoodies back in august. I really got in the mood. 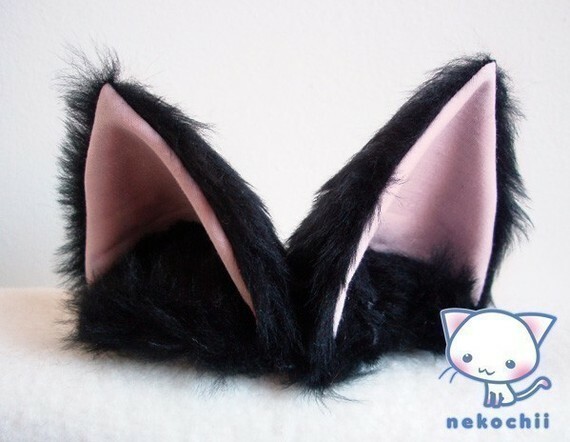 This winter its a kitty ear takeover! So as you can see I started making a few lately, and Im giving you some previews of whats to come, and what can be bought right now. And its not limited to leopard and kitty prints! 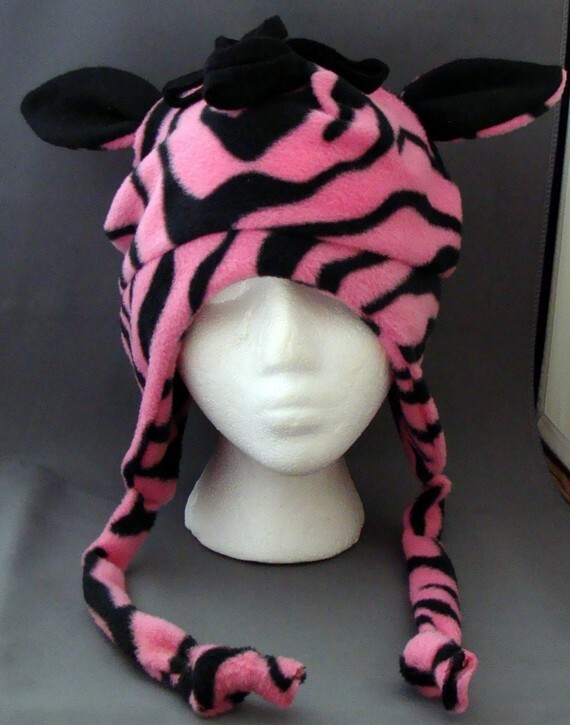 how about a zebra ear hoodie? it works for me! 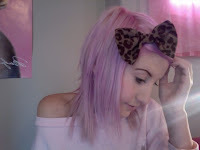 Im so obssesed with this cut that I even decided to make a super soft leopard and zebra hoodie scarf which I absolutly love! And if you want something that is less animal resemblant but still has the cuteness, I made this awesome stripe knit kitty ear hoodie . These hoodie are such a great solution! fuzzy and warm so they keep you nice and cosy in winter, I also added kanga pockets so you dont freese your kitty paws off. And Im thinking of what else to make! got any special coolors you like? I would love making one in a classic black and red for example, I mean really the options are endless! So lets start with some kitty classics! what girl is complete without her paws? 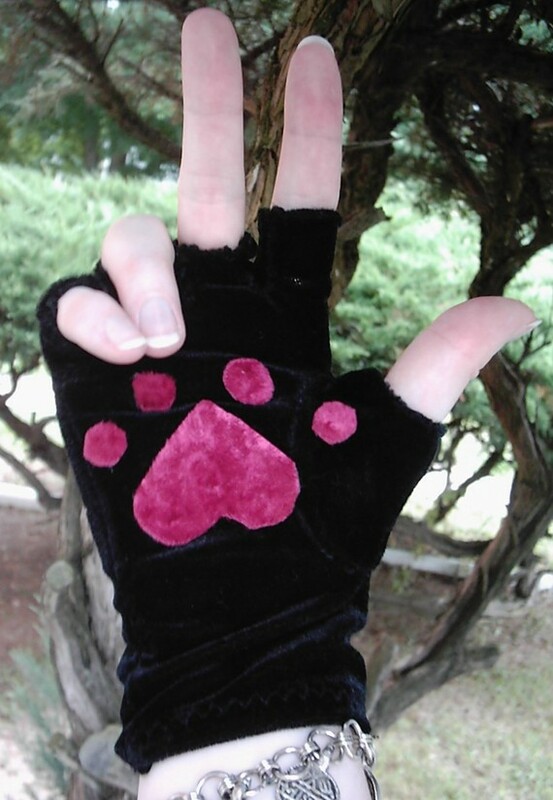 I found these awesome kitty paw gloves by magpiesmasquerie that will keep your hand warm and cosy while looking super adorable! 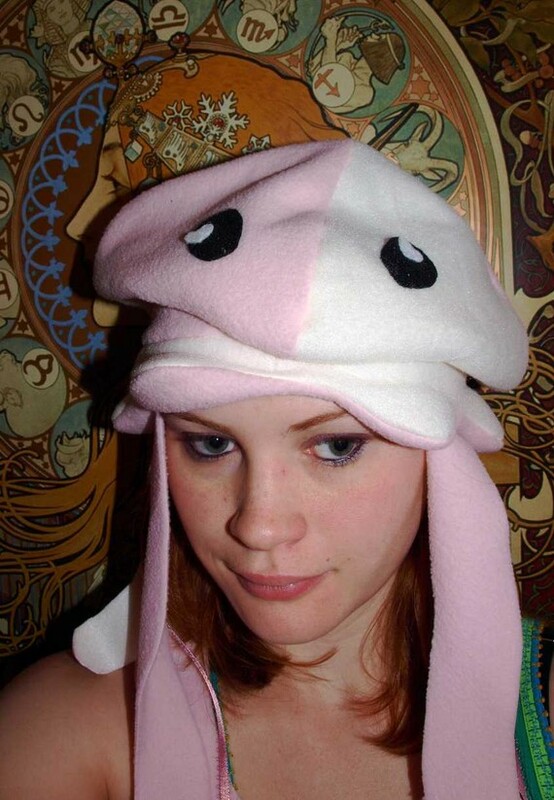 and if were into animal inspirations, she also made this super cute Octupus hat you should check out. 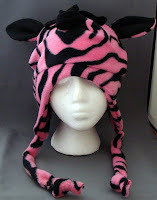 I found another pink deliciouse cap from ForwardMotionArt, its made out of pink zebra fleece which is super warm and suitible for these snowy days. going on with the kitty theme are handbags! 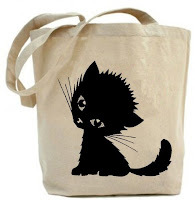 I couldnt resist this cotton kitty print tote by PaisleyMagic ( that will go together amazingly with any leopard kitty ear hood by the way! 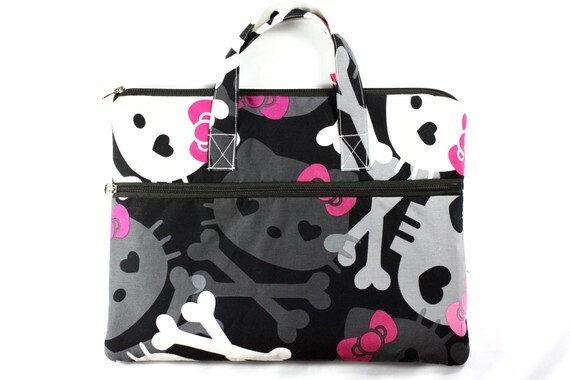 )laptop looks I found a mischievous death kitty laptop bag by bag FA2u. and dont think I neglected your hair! pins bows hair bands , where should I start?! 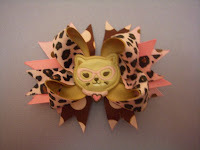 well I almost died of cuteness when I saw these mega puffy hair bows by ammeB! 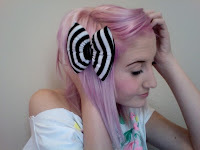 man this girl got it, these bows are so adorable you just want to wear them all day! 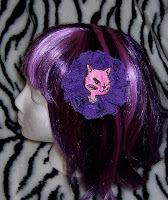 This purple lace and kitty hair clip by cherrydollyface is a great solution if you dont want to go to the extreme but still keep that adorable kitty vibe. 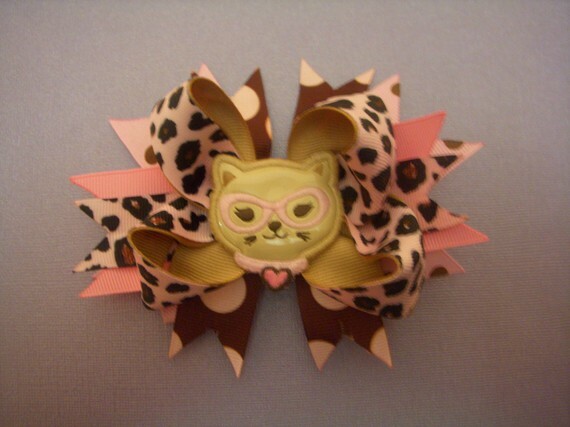 And another cute kitty hair pin you must check out is by gotitabows , I was seduced by its leopard print and wonderfull color coordination! 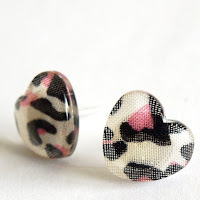 As jewelery I found some cute heart leopard earrings by glamasaurus that will suite your kitty hoodie like a glove (or earring:)) I couldn't resist putting her ear plugs here too, seriously this girl makes me want to go and make my lobes fit them! 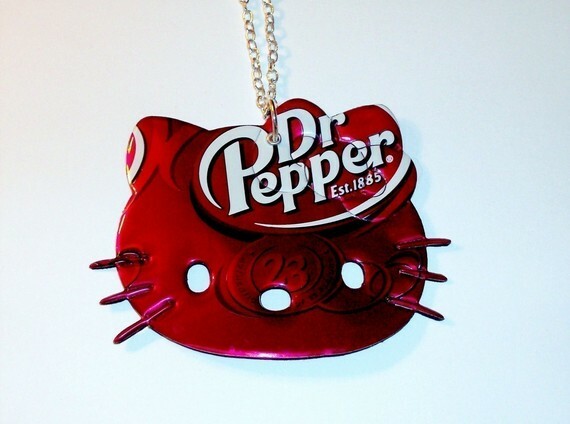 On the necklace department I found this kitty necklace by o0oCuppyCakeo0o. its made out of recycled soda cans which makes them look so unique and helps the environment which is a double reason to buy them! 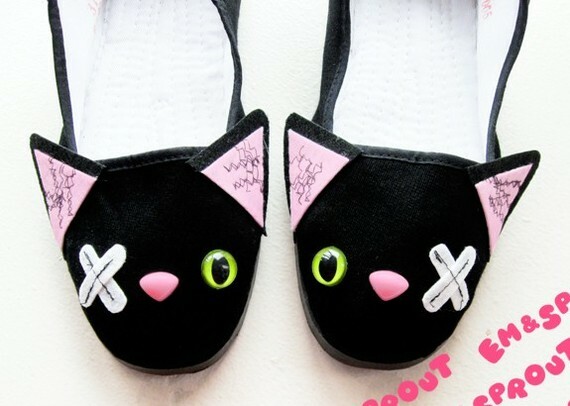 and last but not least, these kitty mary janes by emandsprout will keep your legs looking super cute and animal friendly! So now I dressed you guys from head to toe, go get yourself some kitty gear and make it purrrrfect! * these itmes are coming up soon!!! check back for updates!!! 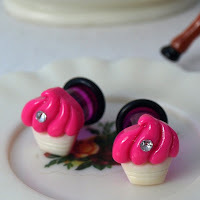 New super deliciouse collection out now!!! New yummy collection coming your way!!! A hard days night or 2 markets in 1 weekend!